Top Cow’s The Magdalena at DriveThruComics! Collecting The Magdalena’s first appearance in The Darkness: Spear of Destiny issues #15-#18, plus the original limited series Magdalena: Blood Divine drawn by Joe Benitez and the continued limited series Magdalena vol. 2 drawn by Top Cow superstar Eric Basaldua and written by Brian Holguin (Spawn) this trade paperback collection delivers the stories that have made the Magdalena a flagship character of the Top Cow Universe. 12 full issues in total! Plus a bonus look into the Magdalena’s other appearances throughout the TC universe! 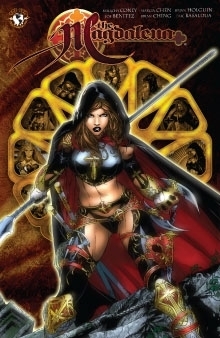 The Magdalena V1 is available now at DriveThruComics.com.